The Infrared Emitter Market is estimated to exhibit rapid growth potential till 2020. The total market for infrared emitter is expected to reach USD 867.1 Million by 2020, at a CAGR of 11.3% between 2015 and 2020. On the basis of industry verticals, the market has been segmented into automaotive, consumer electronics, telecommunication, military & aerospace, industrial, healthcare, security & surveillance, imaging, and others. The security & surveillance market is expected to dominate the vertical market of infrared emitters & receivers, as infrared emitters & receivers are extensively used for security camera, night vision, and thermal imaging among others. The infrared emitter & receiver market is segmented on the basis of applications into thermal heating, sensing, monitoring & detection, imaging, data transmission, and others. Currently, for infrared emitters, the sensing, monitoring, & detection application dominates the market because of the high demand in multiple verticals of security & surveillance, industrial, and consumer electronics, where infrared-based sensors are the key components. Furthermore, the consumer electronics and security & surveillance industry are both expected to grow at a very rapid pace among all other industries. The growth in these two industries is attributed to the growing adoption of infrared emitters. For infrared receiver, the imaging application is the dominating the market, as infrared receivers are used in various critical imaging applications in the form of sensors or detectors, mostly in security & surveillance, military & aerospace, and industrial applications. Furthermore, the high growth in the security & surveillance industry is boosting the market for infrared receivers. The spectral ranges covered in this report are near IR, short wavelength infrared (SWIR), long wavelength infrared (LWIR), medium wavelength infrared (MWIR), and far IR, The near infrared market is expected to dominate both infrared emitter and receiver markets. The geographic analysis in this report covers the North America, Europe, Asia-Pacific, and Rest of the World (RoW). The cross-segmentation data included in the report provides insight into the regional markets. The Asia-Pacific (APAC) currently dominates in terms of market size and is also expected to grow at the highest CAGR during the forecast period. 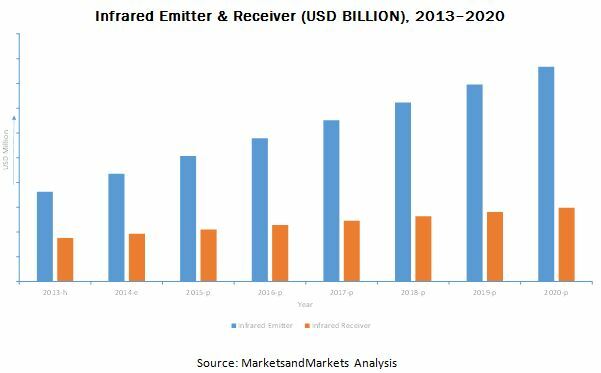 The fast growth of infrared emitter and receiver market in Asia-Pacific is mainly attributed to the growth on the emerging economies such as India and China. Moreover, Asia-Pacific is also the hub for major OEMs for various infrared-related products, which makes it a highly lucrative market. This research study involves the extensive use of secondary sources, directories, and databases (such as Hoovers, Bloomberg Business, Factiva, and OneSource) to identify and collect information useful for this study. The research methodology is explained below. Overall market sizes finalized by triangulation with supply-side data which includes the product developments, supply chain, and estimated sales of infrared emitter & receiver.